IN A FACEBOOK Live video shared this evening by Vera Twomey, the mother made a plea for Health Minister Simon Harris to contact her after she said that the HSE provided her with documents that would not help in her daughter Ava’s case. Ava suffers from a severe form of epilepsy called Dravet Syndrome, and Vera has been campaigning for access to medicinal cannabis for her daughter, who can suffer several seizures a day. 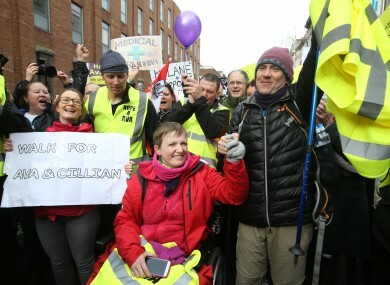 Her efforts culminated in a march from Cork to Dublin, where she said she was offered five options going forward for Ava during a meeting with Simon Harris and the HSE. Despite these positive signs from Tuesday’s meeting, Twomey said her subsequent contact with the HSE has not provided what she feels Ava needs in terms of documentation to bring to her appointment with her neurologist. As per the recommendations from the Health Products Regulatory Authority (HPRA) on medicinal cannabis, the Minister can grant a licence for access to cannabis for medical purposes in individual cases when an application is endorsed by a consultant “who is responsible for the management of the patient”. In the video Twomey said: “I guess we’ve come back to Cork and we are in another bit of a difficult situation. Five options were given to us by the HSE and Simon Harris on Tuesday night. “They were to be followed up on Wednesday morning with three documents to assist our meeting with Ava’s neurologist tomorrow (Friday). The HSE documents given to us at 6.30pm in an undisclosed city centre location were not relevant to the meeting tomorrow, and offered no assistance or clarity to the neurologist to help Ava. She made repeated attempts to get these details handed over, during the course of Wednesday, Twomey said. These documents were not what we even needed for progress. Today, with further efforts to get the correct documents by contacting the HSE resulted in the same documents being delivered.The lack of assistance leaves our family, Ava and our neurologist in a tremendously difficult situation. I would ask someone to contact Simon Harris to contact me. She said that tomorrow’s appointment represents one of their “opportunities for Ava”. Twomey wants Harris’ help “to gather the documents necessary to give the neurologist the opportunity to have a frank and positive discussion” with them. She closed the video by urging Harris to contact her, and thanking her supporters for their encouragement. A spokesperson for the Department of Health told TheJournal.ie that the Minister is pleased that Ava has an appointment with her consultant tomorrow. They added: “He believes that this [appointment] is the appropriate place for clinical decisions to be made”. The spokesperson reiterated the advice given to the minister by the department chief medical officer Dr Tony Holohan, that it would be “neither appropriate or ethical” for the Minister to interfere in a doctor-patient relationship. Email “Vera Twomey urges Simon Harris to contact her after being given 'irrelevant' information to help Ava”. Feedback on “Vera Twomey urges Simon Harris to contact her after being given 'irrelevant' information to help Ava”.